Holmarc Confocal Flourescence Correlation Sectrometer is a microscope with fluorescence correlation spectroscopy (FCS) attachment for capturing molecular dynamics processes in cells, solutions and nano structures. This innovative product is developed with technology from Tata Institute of Fundamental Research (TIFR), Mumbai, a laboratory world-renowned for innovation in the area of FCS. The instrument is also available without the imaging microscope option for solutions study. The instrument is designed for maximum sensitivity through a careful design of the optical path and attentive selection of the optical components and light detectors. We have used two DPSS lasers in the instrument which are 532nm & 405nm with variable power output. Single laser configuration is also available. The laser line clean up filters used in the instrument assures noise level in the laser output to bare minimum. 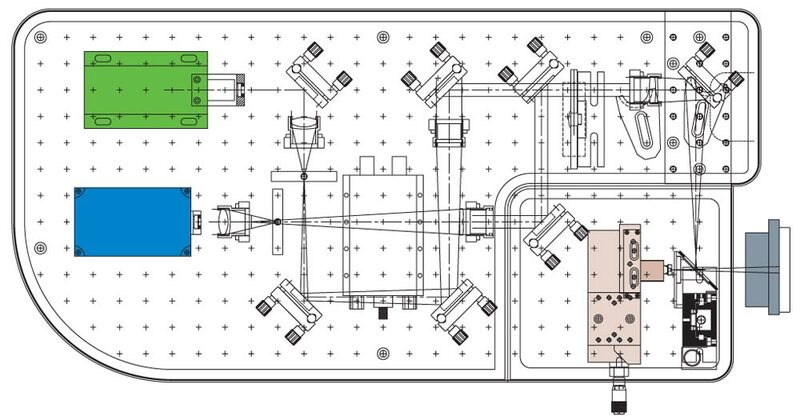 The Optical paths are carefully designed so that the lasers can be used independently without changing any Opto-mechanical or Optics component in the path. Lenses, Mirrors etc are carefully chosen to minimize any aberration or any losses. Dichroic filters, band pass filters, emission filters etc are sourced from best suppliers in the world for matching the laser output and sample data acquisition requirements. High NA (1.20), water immersion Microscope Objective is used for microscopy. These super apochromat objectives, fully compensate for both spherical and chromatic aberrations from the UV to the near infrared region. Their sensitivity to fluorescence emission ensures the acquisition of sharp, clear images, without color shift, even in bright field and Nomarski DIC observations. We have used the Single Photon Counting APD for detection of fluorescence. It detects single photons of light over 400 nm to 1060 nm wavelength range - a range and sensitivity that far outperforms a photomultiplier tube. The fiber-coupled Single Photon Counting APD used has a peak photon detection efficiency of more than 65% at 650 nm over 180 μm diameter. The photodiode is both thermoelectrically cooled and temperature controlled, ensuring stabilized performance despite ambient temperature changes. 1 or 2 colour excitation using 532 nm and 405 nm DPSS Laser with Power adjustable Option. Alternative wavelengths are available on request. Optical Mirrors Coated with Broadband visible, MgF2. All lenses are aberration free, achromatic and coated. A set of neutral density filters included 0.2, 0.3, 0.5, 1.0, 2.0, 3.0 OD mounted on a filter wheel for controlling the excitation power. We pay individual attention to our customers, and are ready to customize any of the parts to meet their needs. For more information contact us at sales@holmarc.com. The digital Correlator card used in the instrument requires no external power supply and can be used for both auto and cross correlation. The instrument is placed in a light proof box which ensures minimum light leakage during operation. The signal output is coupled to 25 microns Optical fiber which is fixed on a XYZ Fiber positioner. The fiber position can be finely adjusted without opening the cover. The fine tuning of the output signal can be done by observing the detector output. The instrument has two options. 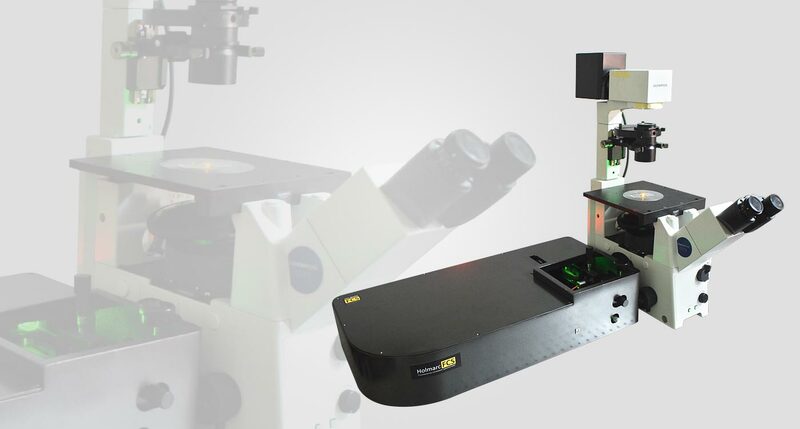 The system can be integrated with a commercial fluorescence microscope for microscopic specimens .It can be used with our innovative non-imaging confocal assembly for solution studies. User friendly software is supplied along with the equipment which is developed in Lab View, shows live count rate and displays the current correlation. The software has the capability to fit FCS data to multiple diffusion models, either online or offline. The software is developed by Tata Institute of Fundamental Research (TIFR), Mumbai. The system is installed on a 6 X 4 Feet Optical Tabletop which rests on pneumatic air isolated support. This ensures ground vibration isolation during operation. All the Opto - mechanical devices used in the setup are carefully chosen for stability and reliability. The instrument is one of the most sensitive ever developed, yet the price is affordable for acquisition by individual research laboratories. 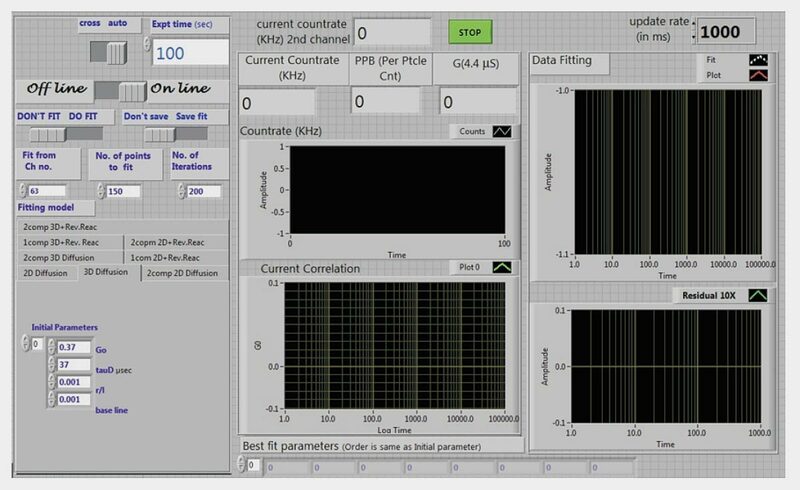 An FCS spectrometer with lifetime measurement option down to 100 ps (using time correlated single photon counting) is coming soon! The current instrument will be ungradable to the lifetime option. Please feel free to discuss with us for all your FCS needs.